Lifesaving has been all in a day’s work for Doug Lathrop for more than 25 years. 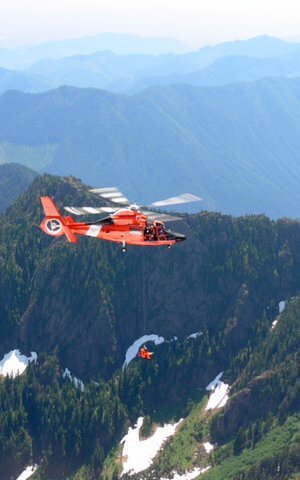 As a helicopter rescue swimmer and advanced helicopter rescue school instructor for the U.S. Coast Guard, Lathrop’s descended to places like Washington’s Olympic Mountain Range (left) where he plucked a climber who had fractured a knee and cracked ribs in a fall. He worked in nine states, including Alaska, and was certified as an EMT. So when he started thinking about life after the Coast Guard, nursing seemed like a natural path. And Lathrop, 50, knew right where he wanted to start that second career: NMC. At 25, Seth DuMoulin is on the opposite side of his Coast Guard career. But like Lathrop, he, too, attends NMC using military benefits, fitting in classes around his active duty schedule at USCG Air Station Traverse City in pursuit of an engineering degree. Lathrop and DuMoulin are among the 5 percent of NMC students who are veterans or active-duty military. They share an academic distinction, too: Both are on the dean’s list. A California native, Lathrop and his family were first stationed in Traverse City from 2000 to 2004, and his youngest son was born here. Other stations followed, and then the family of five returned for a second stint in 2009. In 2013 Lathrop left for his last Coast Guard post, in North Carolina. He rejoined his family in Kingsley in 2014, and started classes at NMC that fall. While he credits the Coast Guard for instilling his work ethic, the pre-ADN student said it’s NMC faculty and staff who have inspired an enthusiasm for learning that didn’t exist the first time he tried college. “They definitely set veterans up for success here at the college,” said Lathrop, who aspires to earn a master’s degree and teach nursing himself. Writing instructors Janet Lively and Jennifer Witt were especially significant, he said, so much so that he’s now employed in NMC’s Writing & Reading Center. DuMoulin (right) agreed college support has been critical to his persistence. 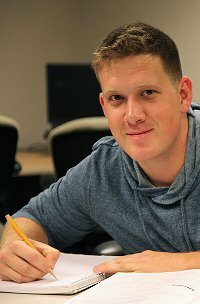 An avionics electrical technician for the Coast Guard, he started in fall 2013 and almost every semester, duties and deployments have prevented regular attendance. “NMC has been really good at working around it,” he said. In spring 2014, for instance, the Coast Guard sent him to two different out-of-state trainings held mid-semester. “I had to complete the semester load in two weeks,” DuMoulin said of his intermediate algebra class. Instructor Jim Szczechowski let him take the final a month and a half early and DuMoulin earned a 4.0. He missed the fall 2014 semester altogether due to an international deployment. He was enrolled and expecting to resume classes in spring 2015 when yet another deployment forced him to miss the first week. Even back in Traverse City, his shift scheduling meant he missed another two classes per month. DuMoulin still landed on the dean’s list. Like Lathrop, DuMoulin said the Coast Guard helped cultivate him into a student. He enlisted in 2010, after an unfulfilling post-high school graduation year working in a Youngstown, Ohio, Pizza Hut. “My study habits weren’t the best from high school,” he said. Now, he prides himself on his academic reputation. His instructors know that if duty calls, he won’t use it as an excuse. “They know I’m going to try on my part to stay caught up,” he said. DuMoulin also tries to visit his two-year-old son back in Ohio as often as he can, and is thinking ahead to summer 2017, when his commitment at Air Station Traverse City will expire. He’d like to find an engineering job in Colorado, where he could snowboard. Whether military or civilian, his advice for student success is simple. “I realized all I needed to do was care. That went a long way,” he said.